The Dream Castle bounce house is a cute and simple bounce house, perfect for any small birthday party or celebration! The castle is purple, pink, blue and yellow. The Dream Castle bounce house is 160 square feet of bouncing area and is available for rent. Please add $30 if you are going to a Park for the Rental of a Generator. 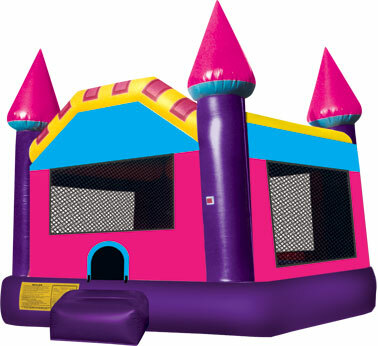 This inflatable, the Dream Castle 15×15, is perfect for your daughters birthday party or any other party, company event, school event, fund raiser, or church event. Keep everyone entertained for hours bouncing around in this inflatable. This unit can hold around three to seven children all at once as great group entertainment when you’ve run out of games to play. With the vibrant colors on our Dream Castle 15×15 you can entertain any theme of party or event. All kids will have a blast and will never forget the time they spent in this jumping castle. Watch your guests and children from the outside through the large netting that provides a safe window and shade from the sun, while allowing a breeze to flow through. This Dream Castle 15×15 requires an area of 18 feet wide by 18 long and 16 feet tall so we can set this castle up to our safety standards. JumpMaxx prides ourselves in providing America with newer, cleaner, high end entertainment with inflatables like the Dream Castle 15×15 and many others.